It's a mess-and-clutter of electronics, sometimes soft and undulating, sometimes frenetic and frantically bleepsome, and it's 21 minutes long. If you can't listen to Sun Araw's new one 'Trellis', well, we understand. It's not exactly easy listening. In fact, it's quite the opposite. 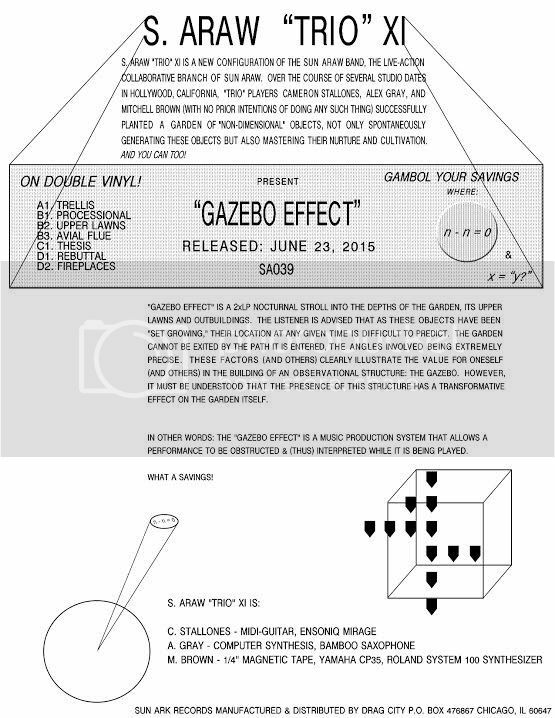 It's a mess-and-clutter of electronics, sometimes soft and undulating, sometimes frenetic and frantically bleepsome, and it's 21 minutes long – and this seemingly improvisatory piece is the opener to S. Araw's upcoming album, Gazebo Effect. "Cameron Stallones, Alex Gray, and Mitchell Brown (with no prior intentions of doing any such thing) successfully planted a garden of 'non-dimensional' objects, not only spontaneously generating these objects but also mastering their nurture and cultivation." Well, that's that. Read the rest of that below. Gazebo Effect is out 23rd June.